This page provides information relevant to the Dinoskeptics documentary currently in post-production. 6) David Elliott: Australia’s luckiest man? 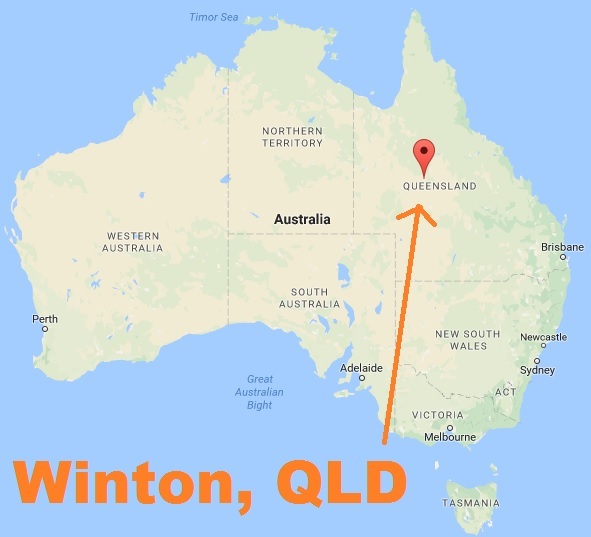 The red bubble signifies the location of Winton, QLD, some 1,300 km north-west of Brisbane. The vast majority of Australia’s dinosaur bones come from north-central Queensland, found in Early Cretaceous rocks formed about 140 million years ago (mya). But even though this is the richest Australian dinosaur region, finds are still rare, and fewer than 10 skeletons are known, some of them rather incomplete. Among the key places of ‘north-central Queensland’ is Winton, a small, rural town home to about 1,000 people. The town’s nearest major city is Brisbane, Queensland’s capital, which is more than 1,300 km (800 miles) away. The area is now advertised as a hot tourist destination, in no small part due to the dinosaur-related commerce for which it is now known. So lucrative has the dinosaur industry been for the region that some have described it as the ‘saviour of Winton’. Several different species of dinosaur have been discovered in and around Winton over the past few decades, most of which have only been officially classified and named in recent years. In fact, one particular Winton resident, Mr David Elliott, has been responsible (directly or indirectly) for most of the finds. A cattle farmer, with no formal training in science (paleontology or otherwise), Mr Elliott parlayed his amazing discoveries into the creation of a brand new dinosaur museum, which he founded with the help of his wife, Judy. Mr Elliott remains chairman of the museum’s parent organisation, the ‘Australian Age of Dinosaurs’ (AAOD) to this day. Australovenator: Discovered/’described’ in 2009 by Scott Hucknell. See item ‘D’ on the image to the right. Diamantinasaurus: Discovered/’described’ in 2009 by Scott Hucknell. See items ‘A’ and ‘B’ on the image to the right. 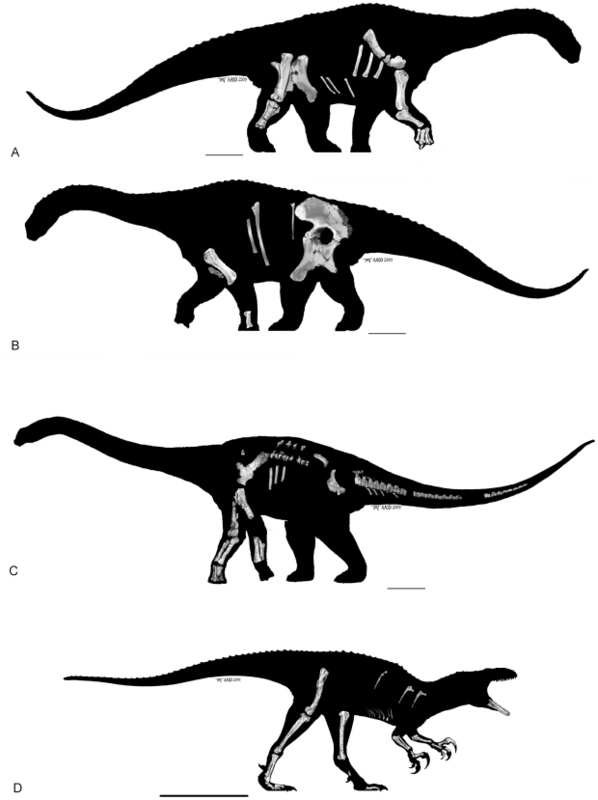 Savannasaurus: Discovered in 2005 by David Elliot, named in 2016 by Steven Poropat. See the image to the lower left. Wintonotitan: Discovered in 1974, later reclassified in 2009 by Scott Hucknell. See item ‘C’ on the image to the right. The image to the right shows the bones which experts claim to have found for the three different species ‘described’ by Scott Hucknell. For the entire scientific paper from which this image was taken, see this link. The image to the lower left of this section shows the bones which experts claim to have found for Savannasaurus, described by Steven Poropat. For the official government-funded media story from which the image was taken, see this link. 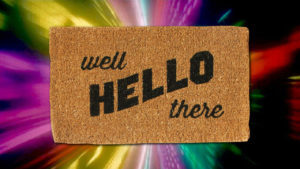 You can click on either image for a larger version. The world has a new dinosaur [Savannasaurus]: a barrel-bellied giant herbivore that stood as tall as a giraffe and grazed the grasslands of what is now central-west Queensland… Almost a quarter of the skeleton has been retrieved – making this the third-most complete Australian dinosaur skeleton. You read that correctly: even though less than one quarter of the skeleton has been ‘retrieved’, this constitutes the ‘third-most complete Australian dinosaur skeleton’ discovered to date. It turns out that the experts are happy to use less than a quarter of a dinosaur’s bones to draw conclusions about the size, shape, and even eating habits of the creature, with ‘draw’ being the operative word. To the right is what people are shown when they visit the Australian Age of Dinosaurs Museum in Winton, and also when they read about the ‘newly discovered dinosaur’ in this article published by the government-funded Australian Broadcasting Corporation. Palaeontologists have unveiled three new Australian dinosaur skeletons in Queensland today. The two herbivores and one carnivore, excavated from the Winton formation, roamed our land during the Cretaceous period – 98 million years ago. Palaeontologist and lead author Dr Scott Hocknull, of the Queensland Museum, says in the past dinosaur discoveries in Australia haven’t been considered important because there were so few of them. In a quirky twist of fate, Banjo (Australovenator) and Matilda (Diamantinasaurus) were both found buried together in what turns out to be a 98 million-year old billabong. Banjo Patterson’s story of Waltzing Matilda describes the unfortunate end to a swagman who steals a jumbuck (sheep) but is chased by police and ends up leaping into and drowning in a billabong alongside his stolen sheep. 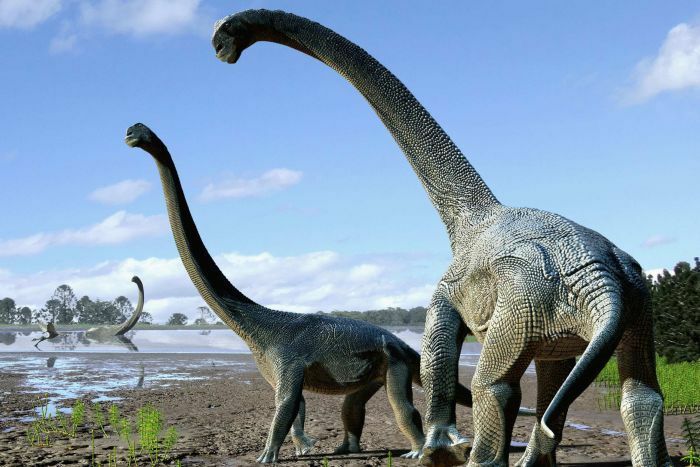 The findings have been published in the public access journal Public Library of Science One (PLoS One), and were announced by Queensland Premier Anna Bligh at the Australian Age of Dinosaurs Museum of Natural History in Winton. It was 2001 and Hocknull had only recently finished his PhD in palaeontology and was about to embark on an expedition to Cape York with the Queensland Museum. The museum had heard of David’s motorbike mustering discovery of bones through highly respected palaeontologist, the late Dr Mary Wade, who had excavated Lake Quarry and retired to the outback. The expedition detoured via Winton to take a look. “We walk in and on a ping-pong table there are dinosaur bones, there’s bones and fragments all over trestle tables, on the dining room table, in the lounge, on some old beds. There were hundreds and hundreds of bone fragments,” says Hocknull, his voice rising with excitement even now. One piece was immediately recognisable as the femur of a big dinosaur and Hocknull saw his nascent career taking shape. The Museum is owned by Australian Age of Dinosaurs Limited, an Australian public company limited by guarantee, and is a not-for-profit organisation. In 1999 while mustering sheep on his property Belmont near Winton, David Elliott discovered the fossilised bone of what was, at the time, Australia’s largest dinosaur. This bone was later identified as part of a giant femur from a Cretaceous sauropod that roamed the Winton area 95 million years ago. Following the discovery of more fossils during digs held in conjunction with the Queensland Museum, David and his wife, Judy Elliott, called a public meeting in Winton on 17 August 2002 with a view to establishing a dinosaur museum at Winton. While mustering sheep in March 2005 David Elliott discovered a new dinosaur site on Belmont and a subsequent dig in September that year uncovered the remains of one of Australia’s most complete sauropod skeletons. So in 1999 Mr Elliott happened upon some dinosaur fossils just laying on the ground; in 2002 he and his wife created a new corporate entity to oversee the creation of a dinosaur museum; then in 2005 Mr Elliott discovered yet another dinosaur on his property. AAOD Ltd is the ‘not for profit’ corporate entity which is responsible for the museum; the former was legally incorporated in 2002, while the latter was officially opened in 2009. Mr Elliott remains the executive chairman of the AAOD organisation. The late Graham Lenton, former Mayor of Winton Shire, after whom the road to the Museum is now named. Edward Warren, another former Mayor of Winton Shire, now mayor of the neighbouring Longreach Region. So the organisation is (or has previously been) run by several current or former Mayors of the local shire; as well as a paleontologist whose claim to fame is officially verifying the dinosaurs found at Winton; and also the man who found those dinosaurs, and his son. These are merely the direct financial contributions, and do not include ‘in kind’ provisions. For instance, the QLD state government also supplied prisoners (yes, prisoners) to build fences, walking tracks, and observational decks for the museum. 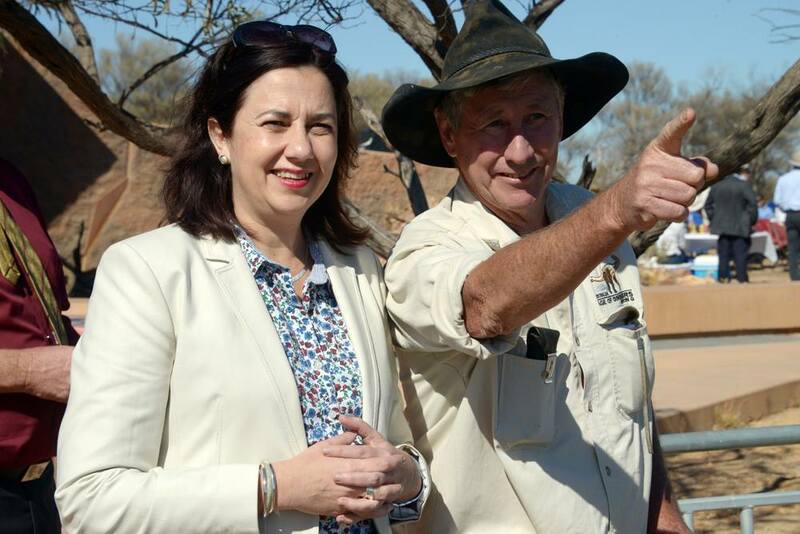 The value of this labour is not included in the above figures, nor is the value of other ‘in kind’ provisions such as sealing the dirt road to the museum from the highway, which was funded by the QLD state government to the tune of $7m. Winton resident, Peter Britton, who donated land for the museum’s future site, said it would bring huge economic benefits to the region. This is where you come if you want to get close to [dinosaurs], work on them or even help unearth them. There is nowhere else in Australia like it, and the good news is that you don’t have to be a palaeontologist to do it. Most of the volunteers at AAOD have no scientific training – they’re taught on the job – and they include children as young as 12. If that doesn’t get them hooked on science, nothing will. 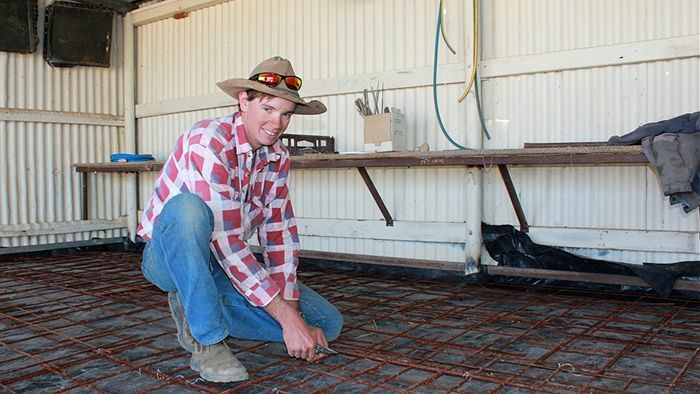 Elliot’s remains were found by grazier David Elliott in 1999 while he was mustering sheep. The Queensland Museum Geosciences team first visited the site in June 2001. David had collected part of the right femur, portions of several tail vertebrae, ribs and hundreds of smaller fragments. These pieces were found on the surface, in patches spread out over an area 250m x 50m. David Elliott was herding sheep on his motorbike in Queensland, Australia, in 2005 when he came across a pile of fossilized dinosaur bones. He, his wife Judy and their children began piecing together tailbones, toe bones and bits of limbs. One day in 2005, Elliott, who had previously founded the Australian Age of Dinosaurs museum with his wife, Judy, was tending to his sheep when he noticed a few fossils on the ground on his property in Queensland. At first, Elliott thought two of the bones belonged to a theropod dinosaur. But Judy found otherwise when she clicked the two end pieces together, revealing that the fossils were actually the toe bone of a sauropod, [Dr Steven] Poropat said. 6) David Elliott: The luckiest man in Australia? Using neighbour hearsay to pinpoint the location of this yet-to-be-identified falling object, Winton grazier David Elliott set about on a two-year journey to uncover the mysterious item. Late last month, Mr Elliott finally stumbled across two pieces of ‘space rock’ which lit up the sky in 2004. “It all started out with a bunch of hearsay from the locals, each adding their understanding of which way the meteorite was headed,” Mr Elliott said. Coincidently, Mr Elliott had been on a trip to the Queensland Museum in Brisbane prior to the 2004 event to check out its latest meteorite display. “These meteorites are not the first I have found – the funny thing is that two months after I visited the Queensland Museum I found a meteorite. The second, smaller piece found nearby a week later will be sold through the Queensland Museum to raise funds for the preparation of dinosaur bones and the AAD museum. [Mr Elliott] hopes to earn more than $100,000 from the meteorite which goes on sale in two months. The Queensland Museum will test the smaller samples before they are sold. He marked where locals said they saw meteorites on a map with “kebab sticks and wires” in a bid to pinpoint where it landed, however, that still left him a 20,200 hectare area to search. In the end, a dream gave him his best indication of the largest meteorite’s location. Mr Elliott knew where to look, because of a dream he had one night. That is his own story. Of course, when speaking to the ABC, Mr Elliott explained that luck was on his side. REPORTER: So you were searching for 50,000 acres? DAVID ELLIOT: Yes, basically, yeah. Like, I couldn’t … you can’t look at the sky and get a really exact measurement of where something is, you know, like there’s nothing to reference on. REPORTER: So was it luck as well, finding it? DAVID ELLIOT: About 99 per cent. REPORTER: With so many things happening in Winton, is this luck part of the town itself? Bruce Collins, the Mayor of the Winton Shire, certainly agrees that everything seems to be happening in Winton. BRUCE COLLINS: Ah, it sounds like it, doesn’t it, yes. I think people in Winton know that if they do nothing, nothing will happen, you know, they sort of have to make it happen. You heard it from the then-mayor of Winton Shire himself: the people of Winton know they need to make things happen. Imagine one man’s great luck in finding a newsworthy and valuable set of meteorites, based on nothing more than his dreams and the anecdotal accounts of rural farmers, and hunting the rock down in an area of 50,000 acres. Imagine that this could happen to the very same man who found not one, but two new species of dinosaur, in fossils laying on the surface of the earth, fully exposed to the elements, tens of millions of years after the creatures became extinct, while out sheep-herding on his motorbike, on the very same property where he found the meteorites! What tremendous fortune!